What will Iowa Workers' Comp insurance offer for my work injury? What will the Iowa Workers' Compensation insurance company offer me for my work injury? After a work injury in Des Moines, your Iowa Workers' Compensation insurance company may be offered one of several settlements. To understand what you may be offered in an Iowa Workers' Compensation claim, speak with a Des Moines Workers' Compensation attorney who will work with you to make sure your claim is handled fairly and efficiently. While there are different types of settlements you may be eligible to receive through a Workers' Compensation claim in Iowa, your settlement will depend on the unique circumstances of your work injury in Des Moines. A Des Moines Workers' Compensation attorney can explain these differences to you. Agreement for Settlement - all parties may decide upon an amount and once approved it will serve to protect an employee's future rights and secure their compensation. Compromise Settlement - if there is a dispute about the benefits, once it is filed and approved, parties will no longer have rights to any future benefits for the injury settlement. Contingent Settlement - dependent upon a specific event, such as when Medicare has to approve the settlement as well. If the specific event doesn't happen, the approval and settlement may be voided. Combination Settlement - establishes a claim with an agreement of settlement and eliminates the remaining balance of the claim with a compromise settlement. Lump Sum Payments - while not typical, sometimes a lump sum payment is awarded. May include a lump sum payment of all remaining future benefits and a partial lump sum payment, which covers part of the remaining future benefits. A Des Moines Workers' Compensation attorney can answer all of your questions concerning your Workers' Compensation claim in Iowa, while you focus on recovering from your work injury in Des Moines. The Des Moines Workers' Compensation attorney team at Walker, Billingsley & Bair know the importance of protecting your work injury claim from the get-go. 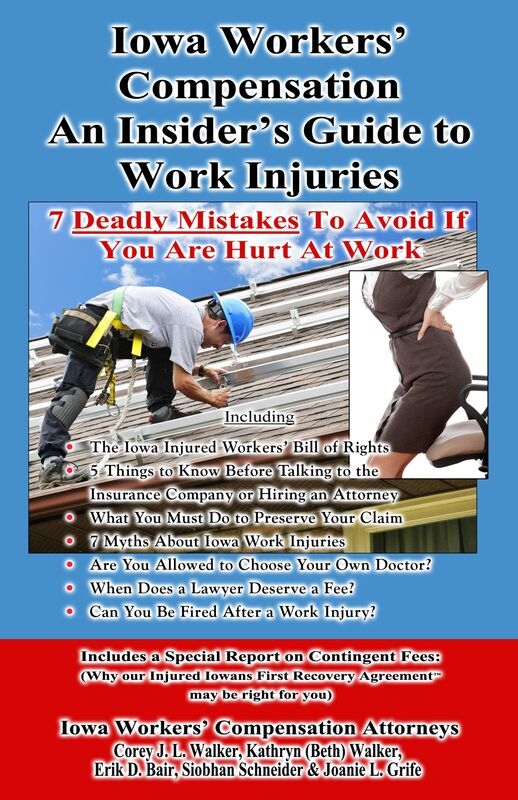 That's why we provide this FREE book; Iowa Workers' Compensation - An Insider's Guide to Work Injuries: 7 Deadly Mistakes To Avoid If You Are Hurt At Work. To learn more about what our legal team will do to help you protect your Iowa work injury claim, contact Walker, Billingsley & Bair to schedule a no-cost consultation - 1-888-435-9886.